Jewish groups slam police for surrendering to terror threats after banning Jews from Temple Mount. Police once again prevented Jews from entering the area of the Temple Mount. 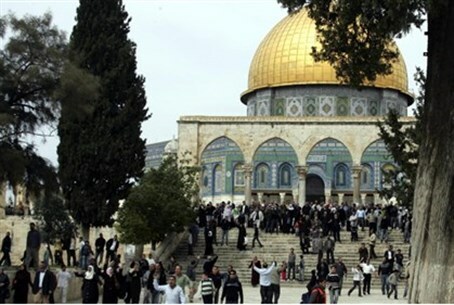 The Joint Coalition of Temple Mount Organizations said that police were again buckling under to threats by Arabs that they would riot if Jews asserted their rights to pray near the holiest spot in Judaism. Leading the group that was banned was Yehuda Glick, who was with a group of students that tried to ascend the Mount on Thursday morning. The excuse this time: The group wanted to carry flags with them, and police said they could not enter. The Coalition had planned to ascend the Mount with Israeli flags Thursday in response to recent "humiliating" measures to which police had subjected Jews seeking to ascend the Mount. Last week, several Jews were arrested on the Temple Mount, and were subject to strip searches, among other indignities.